Most belt conveyors are designed to fit into extremely tight spaces to maximize floor space. Our new cantilever stand mounts can help open them and improve access to the conveyor. Cantilever stands support the conveyor from only one side, which opens the other side up for easy maintenance access and quick belt changes. This feature is ideal when conveyors are placed in tight locations or for applications that require frequent belt changes. 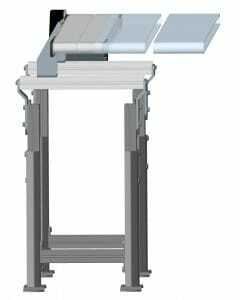 Standard conveyor stands usually have to be removed to facilitate a belt change; this conveyor stand allows the belt to slide right off without removing stands, and by only one technician a great time-saving feature. The unique side-support design of the cantilever stand mount also provides easy access for worker interaction and more efficient cleaning by eliminating obstructions to servicing the conveyor.